One of the key structural In Struts 1.x ActionServlet acts as a front controller and for each request, a new form bean instance is created to hold parameter that is accessed by Action class, while in Struts 2.x FilterDispatcher acts as a front controller. As request received a new instance of action class is created and param interceptor load all the parameter from the request to the field of action instance. Another fundamental difference between Struts 1.x and Struts 2 framework is that Struts1's Action classes are forced to extend an abstract class that makes it not extendable. Struts2's action classes are more flexible and we can create them by implementing Action interface, extending ActionSupport class or just by having executed() method. This is another important difference between Struts 1 and Struts 2 which is often overlooked by Java developers. Struts1 Action Classes were Singleton and not thread safe, that means extra care was required from developer side to avoid any side effects because of multithreading. Struts2' action classes get instantiated per request, so there is no sharing and multithreading, hence they are thread safe. One of the bigger and framework level difference between Struts 1 and Struts 2 is that Struts 1 APIs are tightly coupled with Servlet API and Request and Response objects are passed to action classes' execute() method. On the other hand, Struts2 API is loosely coupled with Servlet API and automatically maps the form bean data to action class java bean properties that we mostly use. If however we need a reference to Servlet API classes, there are *Aware interfaces for that. This difference is one of the most crucial difference as long as code quality and productivity is a concern. Struts1 action classes were hard to test because of Servlet API coupling, but Struts2 Action classes are like normal Java classes and we can test them easily by instantiating them and setting their properties. One more interesting difference between Struts 1 and Struts 2 is that Struts1 requires us to create ActionForm classes to hold request params and we need to configure it in the struts configuration file. Struts2 request params mapping is done on the fly and all we need is to have java bean properties in action classes or implement ModelDriven interface to provide the java bean class name to be used for mapping. Another functional difference between Struts 1 and Struts 2 is that Struts1 uses JSTL Tags and hence are limited. Struts2 uses OGNL and provide different kinds of UI, Control and Data Tags. It’s more versatile and easy to use. One more useful difference between Struts 2.x and Struts 1.x is that Struts1 supports validation through manual validate() method Struts2 support both manual validation as well as Validation framework integration. The 9th difference between Struts 1.x and Struts 2.x version are that Struts1 uses standard JSP technology for providing bean values to JSP pages for views. Struts2 uses ValueStack to store request params and attributes and we can use OGNL and Struts2 tags to access them. Last but not the least difference between Struts 1.x and Struts 2.x is that Struts1 modules are complex to design and look like separate projects Struts2 provides “namespace” configuration for packages to easily create modules. 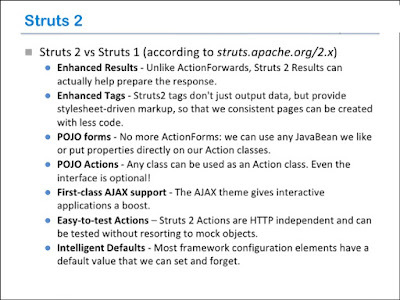 That's all about the difference between Struts and Struts 2.0 web MVC framework in Java. Even though Struts 2 seems an extension of Struts 1, it's a completely different web MVC framework. It's more similar to Spring MVC than Struts 2 itself.